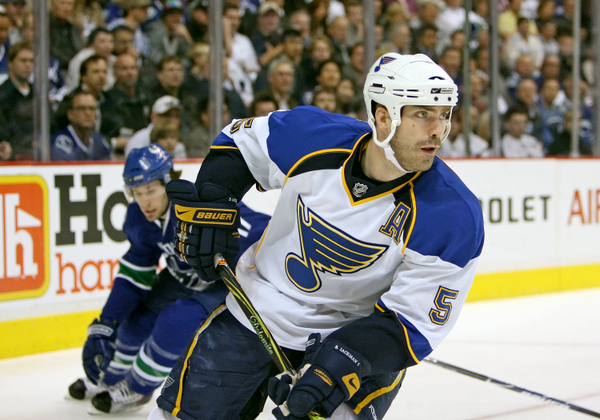 The St. Louis Blues dropped the first bomb of the summer this morning, when a report from long-time Blues insider, Jeremy Rutherford, surfaced about the team’s intent to let Barret Jackman test the open market. The seasoned vet has played his entire 803-game career with the Note, and is 2nd in most games played for the franchise, behind only the great Bernie Federko (927 GP). Though the Jackman news is receiving mixed reviews from fans around the area, it’s good that owner Tom Stillman and GM Doug Armstrong are sticking to their word and are exploring every available option to improve the team and it’s core moving forward. This should allow some of the younger defenseman in the organization their chance to make a difference next season. Look for Petteri Lindbohm and Robert Bortuzzo to get regular shifts; also newly signed NCAA and Prospect’s Camp standout, Jordan Schmaltz, could possibly crack the lineup in a limited role as early as next season. Jackman will always be remembered in St. Louis for his amazing rookie season that saw him win the Calder Trophy (3G, 16A, 19P, plus-23), given to the NHL’s best rookie, as well as his hard-nosed style of play, and his willingness to step up whenever an opponent’s ego needed to be checked. He will also be remembered for his overtime heroics against the Chicago Blackhawks in the playoffs of 2014 (see the NHL.com video above), or his late GWG against the LA Kings in game-2 the year prior (see the NHL.com video below). Possibly overshadowing his on ice career, however, will be all he’s done for the community off the ice, from being an advocate (alongside captain David Backes) with Athletes for Animals, or for his many hospital visits to various groups around the St. Louis area, and to his work for different charities like the Gateway Cup, where he tandem biked to help the Delta Gamma Center for Children (an organization that helps youth who are visually impaired). There’s no doubt Jackman will be missed by his teammates, the fans, and the city, but for the long-term goals of the Blues’ organization it was simply his time to move on. Jax will always be one of the greats to don the Note, and his 1,026 regular season PIMs will likely keep him 4th on the all-time list (of true-Blues) for years to come. The organization knew they had to shake things up after a third straight first-round exit, and yet another big set back in the quest for the city’s first Stanley Cup. Jackman was the first move in what will be a busy summer for the club, who look to shake up their core in order to overcome their past playoff transgressions. Many fans across the area are excited about the coming change, which could see other St. Louis mainstays, such as TJ Oshie, joining Jackman by packing their bags and moving on this summer. Current captain Backes could even be in jeopardy of losing his “C” if the organization feels another leader is ready to step up and guide the team to new heights (here’s looking at you Jaden Schwartz or Paul Stastny). 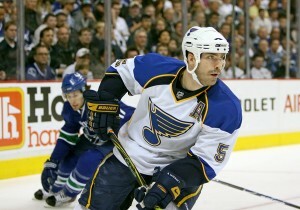 Good luck to Barret Jackman, one of the toughest dudes to ever wear the Blue Note. Quite possible he actually bleeds blue. Thanks, No. 5. Depending on who decides to stay put across the NHL in the coming weeks, it could be a very exciting, yet highly emotional, summer to be a Blues fan. The aforementioned defensive shake-ups should solidify the back-end, and if the team can get good returns for some of the “aging” core (as GM Doug Armstrong put it) this team could be true Cup contenders as early as next season. The silence over the Vladimir Tarasenko contract also likely means that the team is in the process of locking up their current and future superstar long-term, which will begin the transition to the “younger” core who seem to be righting the ship’s course. For now, we bid adieu to Jackman, and say hello to the future of the St. Louis Blues.